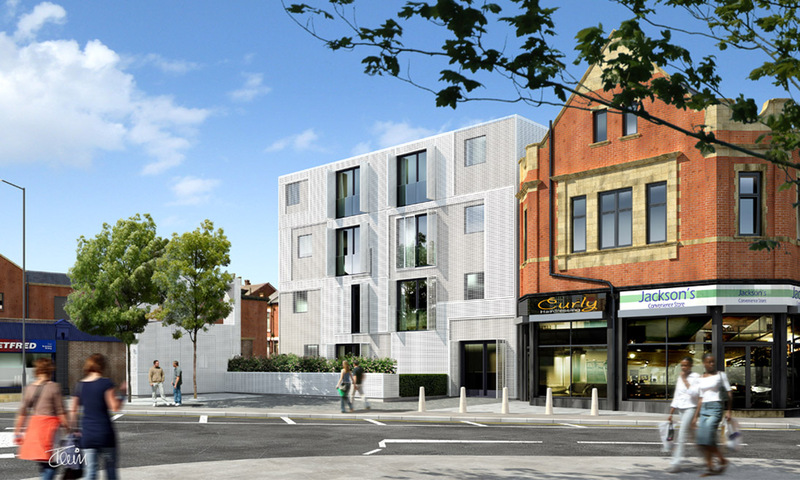 This residential development of 14 apartments has been created on the site of the former Spotted Cow Public House in Holbeck, Leeds. The building form has been sculpted to help the building relate to the varying scales and contextual characteristics around the site. The main public face of the building has been set back from the pavement edge. This enables the creation of a small public space, and ensures that the adjacent Conservative Club building retains its prominence. Our architectural approach was to reflect the original Public House’s distinctive character with a modern white building that continues to provide a striking visual contrast to the predominantly red brick context. The façade material is to be perforated aluminium and, through the introduction of two different perforation sizes, each façade is brought to life with differing levels of light and shade. Although the location of perforations relate to the windows and spaces behind, the apparently random pattern of darker areas across the white façade, provides a subtle reference to the natural character of a cow’s hide. The ‘Spirit of the Spotted Cow’ lives on in Holbeck.